Pepperoncini vs Banana Pepper just what exactly is the difference between these too mild peppers? This is a question that often plagues both shoppers and supermarkets themselves, as pepper identification isn’t likely a part of their training. Besides that, the pepperoncini and the banana pepper can be genuinely difficult to distinguish between, and unsuspecting shoppers can easily wind up grabbing pepperoncini that had been wrongly stocked in a bucket of banana peppers. So how do you tell them apart? While many of the differences are very subtle, there are a few key characteristics that can be used to distinguish between the two. The appearance is where people often struggle the most, and distinguishing between the two peppers can be a doozy. In fact, they are often so similar that supermarkets and experts even have trouble sometimes. There are, however, a few key external characteristics that set them apart. Both the banana pepper and the pepperoncini grow to be about 2-3 inches in length, and both are a yellowish-green color, but the banana pepper typically has a more subtle curve that is more reminiscent of a banana, hence the name. Banana peppers usually retain their shape from the stem to the pointy end, whereas the pepperoncini can appear shriveled up with sort of a flattened bottom. Keep in mind, however, that these characteristics aren’t always absolutes and that variations in the appearance of both peppers can make them almost indistinguishable. Another physical distinction is the skin itself. Banana peppers, like a banana, have smoother skin, while pepperoncini typically have more noticeable wrinkles. The pepperoncini and the banana pepper are typically interchangeable in recipes. 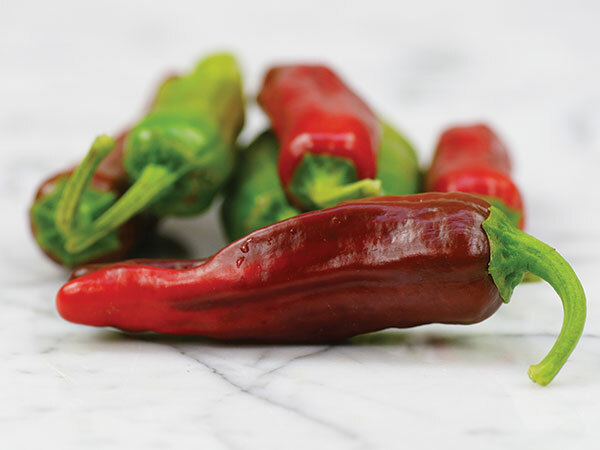 Both peppers are mild in heat, sweet, and tangy, with pepperoncini often being tangier. Pepperoncini are more commonly used for pickling purposes due to their thin walls that allow them to absorb liquid. While neither pepper is particularly hot, both of them typically max out at 500 SHU, meaning that even their heat levels are almost identical. The Scoville scale actually puts banana peppers at a range of 0-500 SHU and the pepperoncini at 100-500 SHU. This means that the pepperoncini with the lowest heat level is still usually hotter than the banana pepper with the lowest heat level. To put that into perspective, a jalapeño falls in the range of 3,500-8,000 SHU. The banana pepper is actually one of the only peppers that can drop to a zero, so if you are looking for a zing that is ever so slight, the pepperoncini may be the more appropriate. Banana peppers are commonly added to stir-fries, spaghetti recipes, pizzas, omelets, and even soups, while pepperoncini are more commonly used in sandwiches and salads. The thickness of the banana pepper makes them easier to stuff, bake, fry, or roast, and the crunchiness of the pepperoncini can make them an excellent addition to a salad. If you are shopping for either type of pepper, you may find that banana peppers are more frequently available fresh, while pepperoncini are more often found pickled. The availability of fresh peppers may vary from store to store. « Is Pudding Gluten Free ?